Israel OKs New Settlement Construction In West Bank : The Two-Way The housing minister has approved the construction of 1,200 new apartments, a move that threatens newly restarted peace talks. 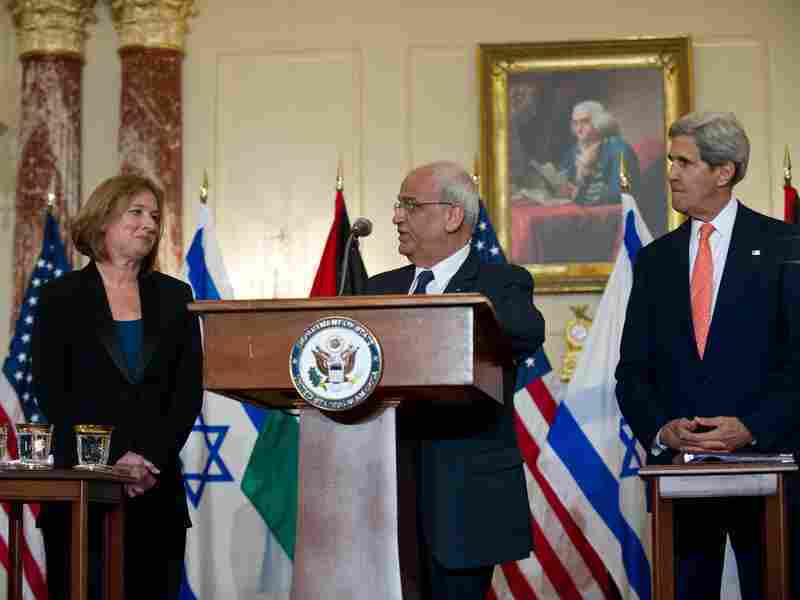 Chief Palestinian negotiator Saeb Erakat speaks to the media with Israel's chief negotiator and Justice Minister Tzipi Livni (left) and Secretary of State John Kerry in Washington on July 30. Israel's housing minister has given the green light to build 1,200 apartments in Jewish settlements in the West Bank, complicating newly revived peace talks with the Palestinians. The decision comes as the two sides prepare for a second round of talks in Jerusalem after a high-level meeting in Washington, D.C., on July 31 — the first in five years. "The Palestinians want to establish a state in the West Bank, Gaza and east Jerusalem, captured by Israel in 1967. Israel has built dozens of settlements in the West Bank and east Jerusalem that are now home to some 560,000 Israelis. In the end, Abbas agreed to enter talks without a settlement freeze. In an apparent tradeoff, Israel agreed to release 104 long-held Palestinian prisoners in four installments over several months, with the first group of 26 to be freed Tuesday." In a letter to Secretary of State John Kerry last week, the chief Palestinian negotiator, Saeb Erekat, accused Israel of "bad faith and a lack of seriousness" over the settlement expansion. Without halting settlement activity, it was difficult to see a way to "bring about progress towards a peace agreement," Erekat told Kerry. He urged Kerry to "take the necessary action to ensure that Israel does not advance any of its settlements plans and abides by its legal obligations and commitments". State Department spokesperson Jen Psaki said the U.S. had expressed its concern to the Israel government and that "we do not accept the legitimacy of continued settlement activity." Reuters reports that Israel's Cabinet decided on Sunday to release 26 Palestinian prisoners "over the next few days" as partial fulfillment of an earlier pledge to release a total of 104 prisoners — a move that helped open the door to talks.